Industrial production in the Basque Country fell by 1.1% on the previous month. Industrial production in the Basque Country grew by 0.3% in December 2010 compared to the same month of 2009 in homogenous terms of the working calendar, according to EUSTAT data. The accumulated rate of growth for 2010 overall, with respect to the previous year, was 1.8%. 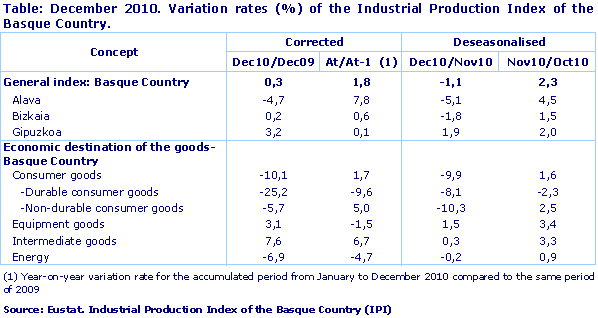 In December 2010, industrial production in the Basque Country fell by 1.1% on the previous month, once corrected for seasonal effects. By sector, and according to the classification of the major industrial sectors, the following variations were noted in the index in December 2010 compared to December 2009: Capital Goods posted a positive year-on-year change of 3.1% and Intermediary Goods were up 7.6%. However, Energy fell by 6.9% and Consumer Goods were down by 10.1%, due to the drop registered by Consumer Durables (-25.2%) and by Consumer Non-Durables (-5.7%). The month-on-month variation in December 2010, compared to November, was positive for Capital Goods, which posted growth of 1.5%, and Intermediary Goods, which improved by 0.3%, while Energy was down by 0.2% and Consumer Goods by 9.9%, as a result of the downturns registered by Consumer Durables (-8.1%) and by Consumer Non-Durables (-10.3%). By province, the December year-on-year performance for the Industrial Production Index was positive in Gipuzkoa, up 3.2%, and Bizkaia (+0.2%) while it fell by 4.7% in Álava. The month-on-month growth rate was positive in Gipuzkoa, up 1.9%, but negative in Álava, down 5.1%, and Bizkaia, where it fell by 1.8%. The 2010 balance for the Basque Country ended with the Industrial Production Index posting a 1.8% accumulated increase. The main industrial sectors posted different performances in terms of the annual accumulate. Capital Goods were down by 1.5% and Energy fell by 4.7%. Intermediary Goods rose by 6.7% and Consumer Goods, overall, were up by 1.7%. Within the last category, Consumer Durables fell by 9.6%, while Consumer Non-Durables rose by 5.0%, compared to 2009. The accumulated variations in 2010 for the three provinces were positive in the three cases: up 7.8% in Álava, by 0.6% in Bizkaia and Gipuzkoa posted 0.1% growth. Basque Statistics Office C/ Donostia-San Sebastián, 1 01010 Vitoria-Gasteiz Tel:+34-945-01 75 00 Fax:+34-945-01 75 01 E-mail: eustat@eustat.es Contact: Gerardo Pérez Aja Tel:+34-945-01 75 06 F ax:+34-945-01 75 01 Further press releases on Industrial Production Index of the Basque Country (IPI). 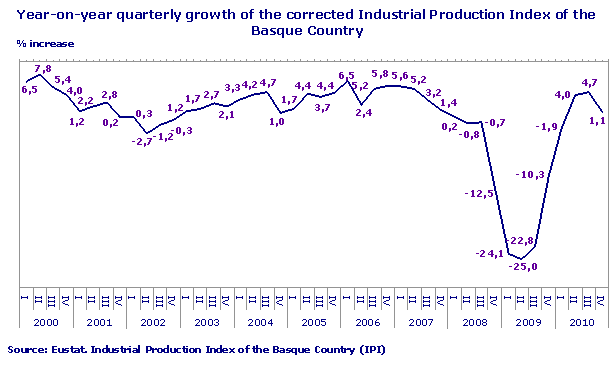 Databank on Industrial Production Index of the Basque Country (IPI).